The following videos show reports or interviews of external producers publishing them on their own web sites. These videos give a very good look at features or the operation of our instruments. tv-bay BroadcastShow also visited RTW at IBC 2013 in Amsterdam. 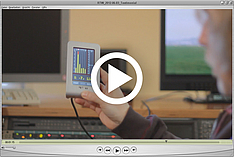 Martin Leuenberg from the RTW sales team explains RTW's new development LQL - Loudness Quality Logger. tv-bay BroadcastShow made an interview with Arjen Hofland at NABShow and posted it as video on its web site.